Will 2016 Be the Hottest Year On Record? “On record” meaning since the 1880s, i.e., the end of the Little Ice Age. The year is a long way from being over, but I will venture a guess that the alarmists will claim 2016, when in the books, was the hottest year evah. One problem, as we have pointed out many times, is that the books have been cooked. 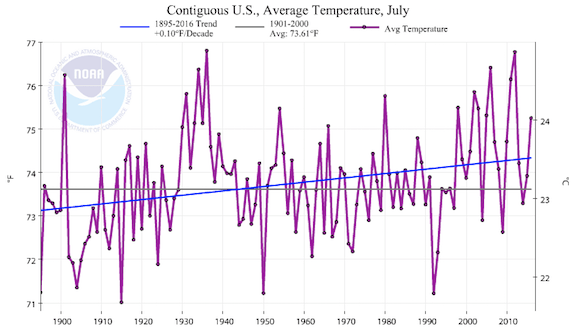 NOAA shows July temperatures increasing at 1.0F per century since 1895, with 2012 tied with 1936 as the hottest July. The actual raw temperature data they use to generate their graph, shows one tenth as much warming from 1895 to 2016, with 1901, 1936 and 1934 as the hottest years. 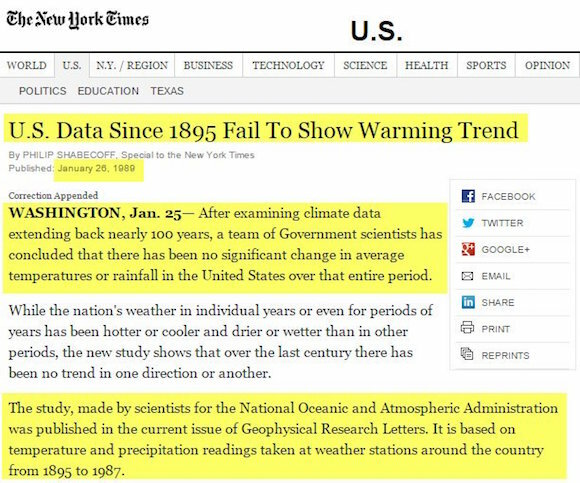 If 1895 is removed, there is no warming at all. NOAA creates this warming by massively cooling the past. They got rid of the hot 1901 by cooling it 2.13 degrees. They cooled 1936 by by 1.13 degrees and cooled 1934 by 1.11 degrees. That is what it took to elevate 2012 to the hottest July. Emphasis added. So NOAA’s “adjustments” increase global warming by 1,000%. Gosh! Why might they do that? The claimed warming trend in the US is completely fake, and is altered by people at NOAA who are being paid to push the global warming agenda. Before they were paid to push anthropogenic warming, the very same people at NOAA (i.e. Tom Karl) knew that there was no US warming. That was reported by the New York Times, before the Times understood how global warming hysteria could be used to augment the power of government. The US makes up less than 10% of the land surface, but contains the majority of the high quality long term temperature monitoring stations for this planet. 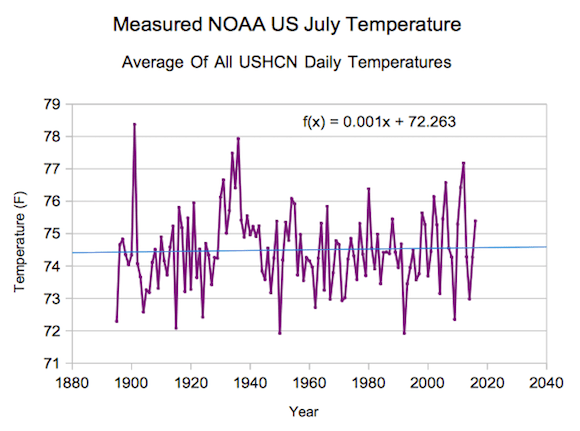 The global surface temperature record is a farce, which is why the US data is so important. As I have said many times before, catastrophic anthropogenic global warming alarmism is not an honest scientific mistake. It is a fraud, perpetrated for the usual reasons–money and power.